a. What to look for? To realize that the sea ice conditions in winter 1941/42 in the Baltic have a lot to do with naval warfare during the second half of 1941, there are actually not so many aspects one needs to look at. There is the time of commencement, the ice cover, the ice thickness, and how long the ice lasted. In general terms it can be said, that icing started early in the Bothnian Bay , but varied during December and early January, to spread since mid January fairly promptly everywhere in the Baltic. That is well compiled in the annual reports from Denmark and Sweden and in two papers by Erkki Palosuo/Finland. As communication during war was difficult, or impossible, and the Germans lost most of their records, there might be gaps. Nevertheless the information available is quite comprehensive, of which only a short summary from each of the three mentioned sources is given here. The situation along German waters has already been mentioned in section E2. The winter 1941/42 was extraordinary long lasting and cold in spite of December having a mean temperature above normal. The first ice appeared on November 4th, which is an extraordinary early date. Real ice forming set in after January 7th and closed the fairways by the end of January. The last ice disappeared by May 15th. The winter 1941/42 was quite unusual in character, long lasting and cold. Many stations had more than 100 ice days, the maximum was 122 days. The ice thickness averaged above 30 cm, and in a few places above 70 cm. The report includes 7 ice maps (between Jan 21. to April 12); each offering specific characteristics for interpretation. 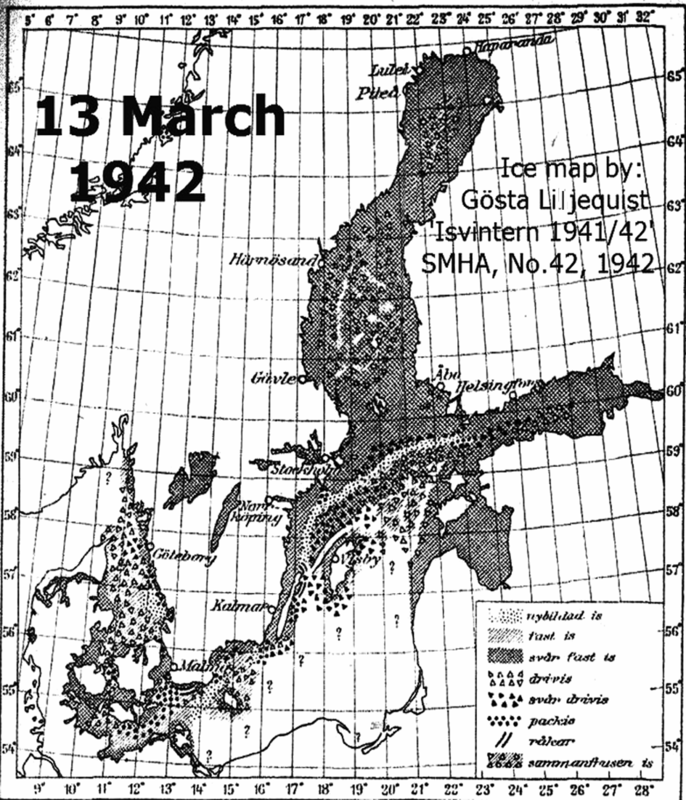 Here only the ice map for February 2nd 1942 is reproduced. Concerning the ice situation in the Skagerrak one week later, see Fig. E5-3. 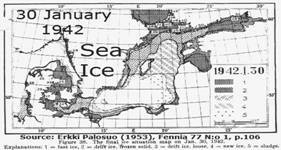 The formation and breaking up of the ice took place at a rather normal time in the Gulf and Sea of Bothnia . The formation of ice in the Baltic and at the West-coast started in the first part of January, generally one or two weeks earlier than normal. The ice conditions grew worse after the mighty invasion of cold air on January 24th, when temperatures between –25°C and -30°C were recorded in the whole country; at the same time the wind-force was 6 and more on the Beaufort scale. Due to prevailing easterly or north-easterly winds, heavy pack ice formed in the Baltic along the Swedish coast. Gotland was isolated twice from the mainland, for four weeks in February and three weeks in March. Compared with normal conditions the breaking up of ice was very late at the West-coast and in the Baltic, especially in the Sound and the West-coast. The sound was not ice free until the end of April and beginning of May, which is about two month later than normal and the latest break-up since 1870 when regular ice observations started. On June 6th all Swedish waters were ice free. 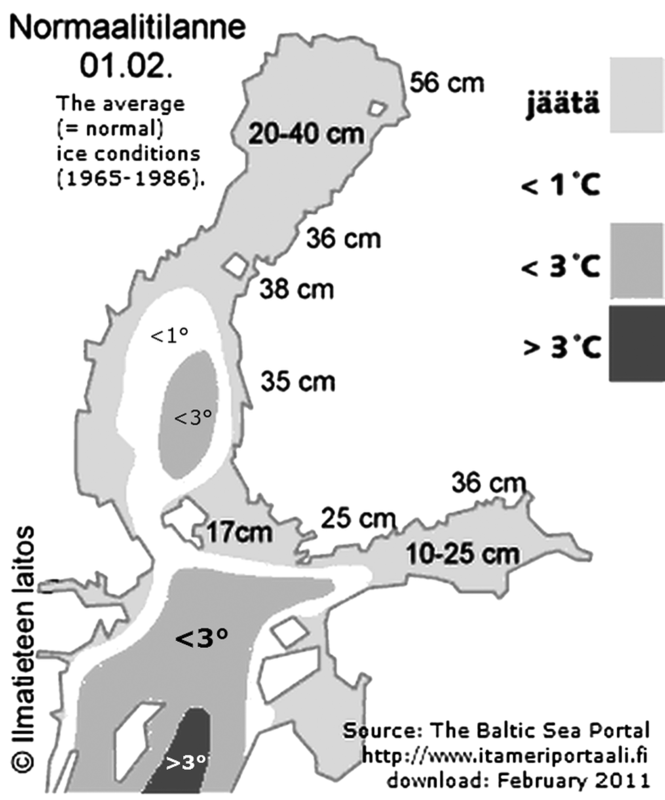 The thickness of ice was about 100cm in the Gulf of Bothnia – the maximum value observed this winter was 125cm. A prominent feature of the breaking up of the ice was the fact, that the harbours and the river estuaries became ice free earlier than water further out at sea. This seems to be the rule in sever ice winters. 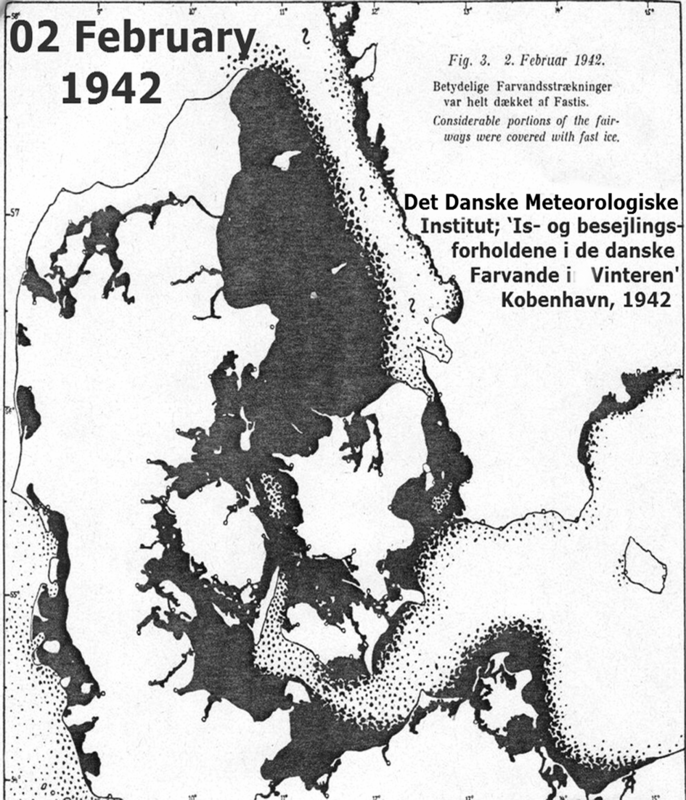 In the Baltic and the West-coast ice conditions in the winter 1941/42 became generally worse than those in 1939/40 and 1940/41; in the Sea and the Gulf of Bothnia , however, they were as a rule of about the same severity as during the two previous winters. 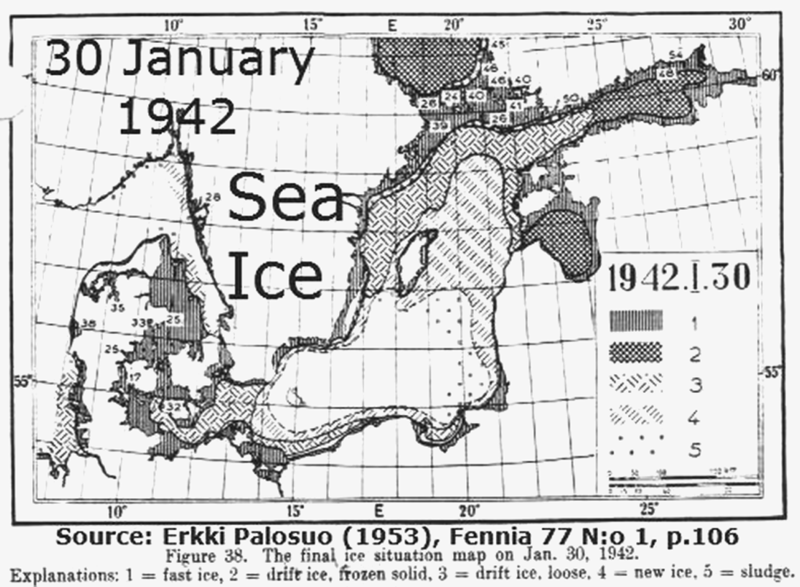 The ice period was generally longer than in 1939/40 but about the same as in 1940/41, except at the West-coast and in the Sound, where it lasted longer. Erkki Palosuo (1953, pp. 33-88) served as a reconnaissance pilot to observe sea ice during WWII. 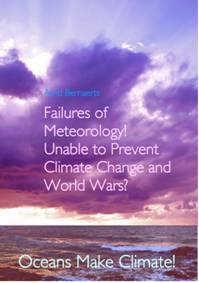 After the war he studied meteorology and became a leading sea ice expert, with numerous publications. This paper from which the first excerpts are taken on the ice situation during the winter 1941/42 covers about 50 pages (see Fn.1). 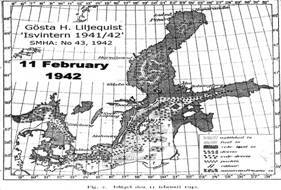 The main focus will be given to the Gulf of Finland , as this was the area with most naval activities and many sea mine barrages. __The freezing began earlier than usual in the northern part of the Bothnian Bay . But the freezing over was quite exceptionally early in the south, in the region of the Gulf of Finland ; during the following frost period, when at the end of October, ice formed in the coastal bays. During the third frost period, which came in the middle of November, ice covered the inner archipelago of the Gulf of Finland . It was exceptional to have three periods of frost as early as this. __A new and comparatively hard period of frost began in the early part of December. In the middle of December the open sea of the Gulf of Finland was iced over throughout the field of view of the fixed observation stations along the coast as far west as Pellinki. 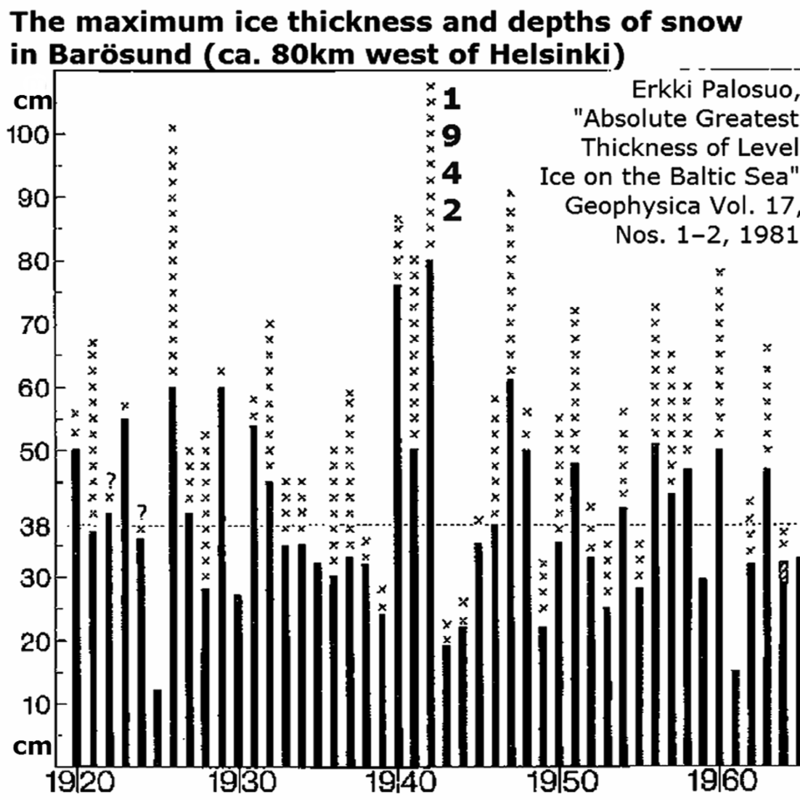 __Unusual ‘openings’ of 10-15 metres in diameters appeared in the new ice in Finland bays around New Year eve. Palosuo reasons about their causation on page 35. __On January 6 a strong outbreak of arctic air mass began to push outwards from the north of Finland , resulting in the formation of a ridge of stationary high air pressure over Scandinavia . By January 15 the outbreak of cold air had reached Germany , where the independent cold air pool was formed; (see: E4). __A bridge of fast ice formed in the Åland Sea (Jan 16, 5cm; Jan 30, 26-35cm). __Due to stormy weather at the end of January existing sea ice was moving and influenced ice condition in the open sea in the western Gulf of Finland and northern Central Baltic considerably. … It is not in fact rare for ice to be driven westwards in the Gulf of Finland , and even in the northern Central Baltic area. But that it should happen so early and be so clearly traceable is uncommon. __On January 31, the eastern area of the Gulf of Finland , the ice was unbroken, as confirmed by an air reconnaissance flight on February 4th. __In early February all available observations indicated a full ice cover, including from a German source by February 5, that the entire Central Baltic was covered by ice. NOTE: The information concerning a precise date when a full ice cover in the Gulf of Finland and Baltic Proper could be assumed is not very clear, it seems it came into being around February 6th, when hard frost and calm weather prevailed throughout the Baltic, and the ice became considerably heavier. __The culmination of the ice winter was in the Kattegat and Skagerrak on about March 14, and around March 20 in the northern Central Baltic. __The last ice in the Gulf of Finland region was reported on May 27, in the Bothnian Bay on June 13. 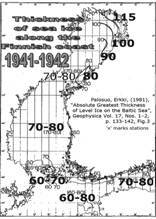 Concerning the ice thickness Palosuo (1981) observed (Fn, 1): “The absolute greatest ice thickness on the Baltic occurred during the severe winter of 1941/42. 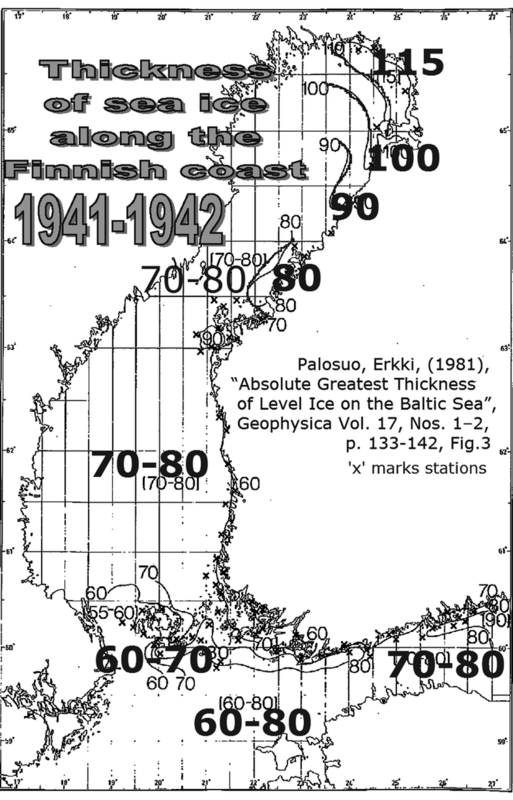 Thickness of up to 115cm was measured in the northern Bay of Bothnia , and 80 to 100cm were recorded in the Gulf of Finland .” For example, the station Barösund-Bagaskär (about 80 km west of Helsinki ) where a mean thickness is 38cm, observed 80cm during the third war winter, see Figure below (E5-7), only few weeks after the Russians evacuated Hanko in early December 1941, see E3. evidence for the causal link with previous military operations in this sea area. Further evidence can be drawn from the enormous thickness to which icing grew. It was partly twice the normal values. This happened especially to a water body, which had already greatly cooled down before an ice sheet formed. To understand this connection, it requires no great effort or experiments. This was demonstrated very practically at the Finnish station Barösund. 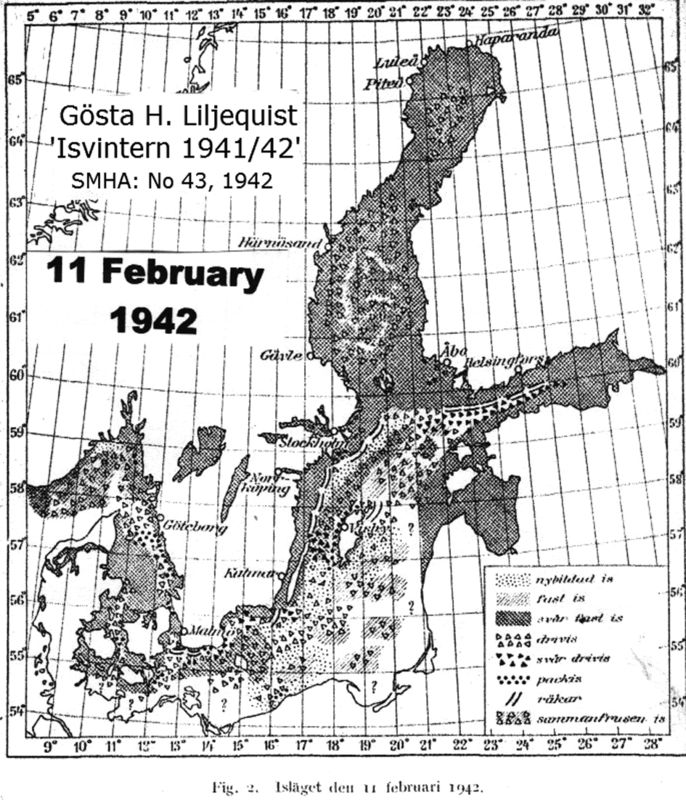 The existence and the course of the ice winter 1941/42 provides evidence to the effect of human activity on the water body of the Baltic and thus to the atmosphere. The sea ice conditions in the Northern European sea areas proved to be anthropogenic climate change and weather making. The sea ice processing in winter 1941/42 deserves to be investigated, and understood as part of a great climate experiment to confirm anthropogenic relevance.